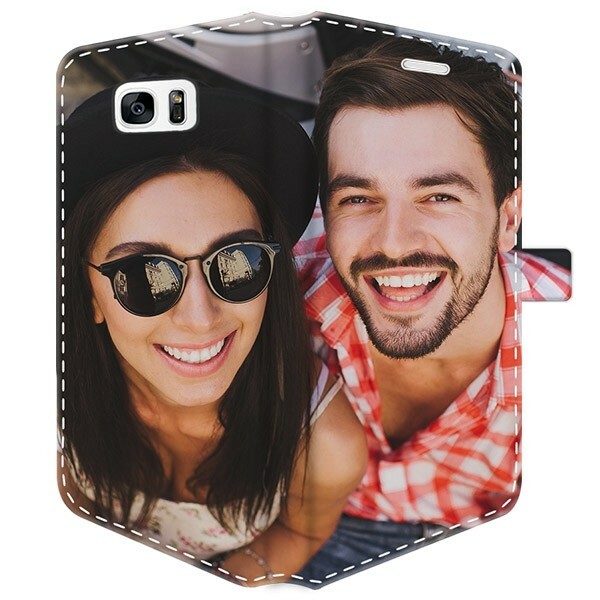 Have your gorgeous picture printed all around the custom Galaxy S7 Edge case. 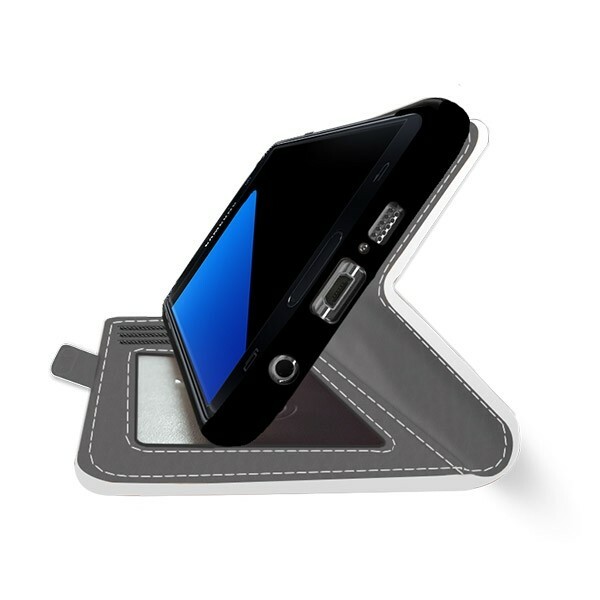 A customized wallet case is about so much more than protection. Surprise your friends and family with a Galaxy S7 Edge wallet case! Imagine, you’re standing in line at the cashier and you’re ready to pay, but realize last minute that you left your wallet at home. How embarrassing is it to have to take everything off the counter and call someone to bring you your wallet from home. A wallet case prevents these kinds of awkward moments! The front flap of the wallet case has two pockets and plenty of room to store cash and cards. In addition, it provides your phone with the protection that it needs and deserves. The Galaxy S7 Edge wallet case is made of plastic leather and the cover features a magnetic flap so your phone is always covered when you’re not using it! Your phone can be easily placed into the case and is held tight when clicked in. Worried about limited functionality on your phone? We’ve strategically placed openings on the phone case so that you have full access to all buttons and ports that you will use daily! 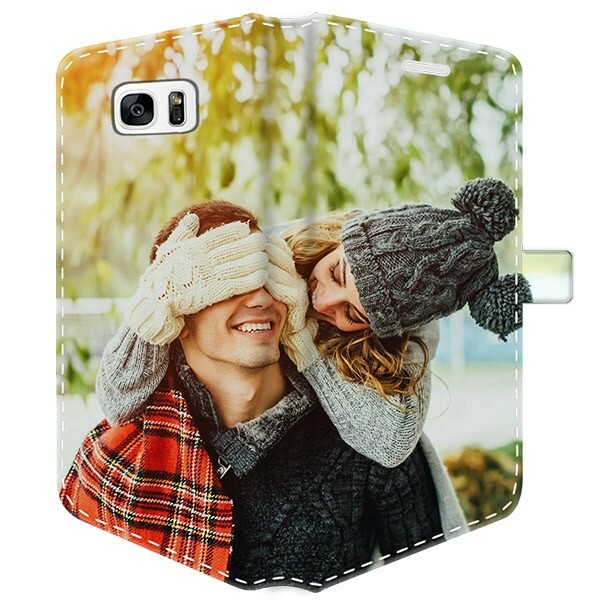 You can still easily charge your phone, listen to music and take pictures anytime you want, without any disruption with this custom Galaxy S7 Edge case. Designing a custom Galaxy S7 Edge case is simple and fun! Using our user-friendly design module, you can design a custom Galaxy S7 Edge case in no time. Additionally, with the level of customization possible, it’s also fun to do! You can include all kinds of pictures, whether it is from a family vacation or something that you drew up! Take some time, sit down with a friend, look through your favorite moments and design a phone case together! It’s also possible to upload pictures from Facebook and Instagram directly into our design module. If you don’t have an idea for a picture, don’t worry! We offer a handful of in-house premade designs and colors that you can choose from. Design your Galaxy S7 Edge wallet case now! 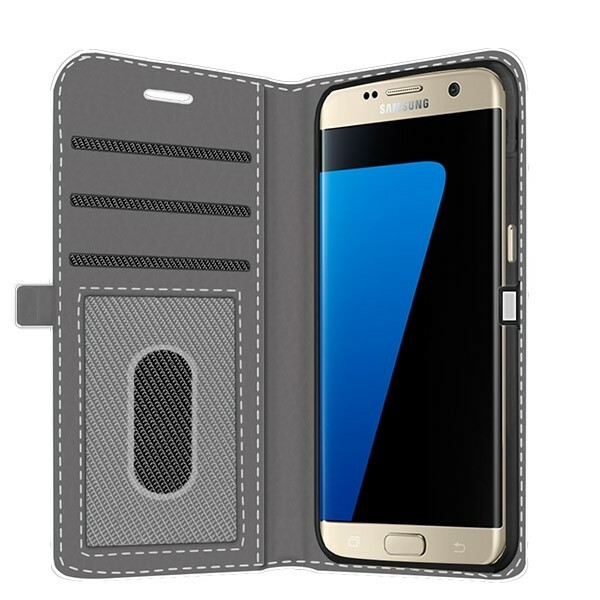 The Galaxy S7 Edge wallet case is printed on a white background and we implement advanced printing and use high-quality ink to create the best possible smartphone for you! This ensures that your picture comes out very sharp and that your phone case will remain durable! In addition, we can print the cover very quickly, so you will have your phone case in your hands as quickly as possible. We normally print and ship within 24 hours of your order, barring any out of stock cases! Your custom Galaxy S7 Edge case will be delivered directly into your mailbox, so you don’t have to wait at home!